The 9 inch bamboo circulars have steel stranded cables on US sizes 0 through US 2.5. Sizes 3 and up have the clear nylon cables. 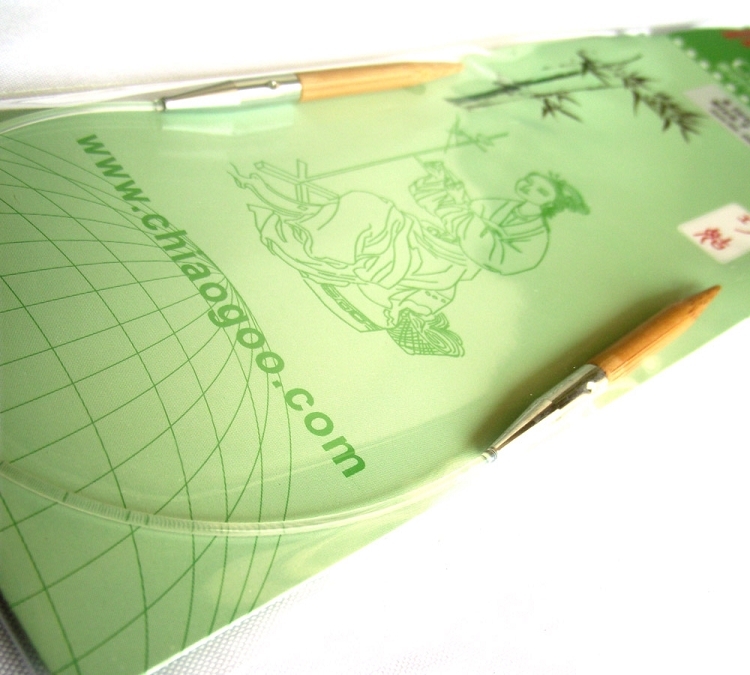 ChiaoGoo 9 inch (23 cm) patina, bamboo circulars have fantastic joins and pliable, clear, nylon cables. They have a nickel-plated, copper join. Sizes 3 (3.25 mm) and larger are crimped to guarantee no separation AND they swivel! Sizes 0 (2 mm) through 2.5 (3 mm) do not swivel at the joins. Sizes 0 (2 mm) through 2.5 (3 mm) have the same memory-free cable as the ChiaoGoo RED circulars and TWIST cables but without the red nylon coating! Needle size is permanently laser imprinted on each circular. Bamboo circulars are available in the patina color only. I love these 9 inch circulars for socks, mittens, and sweater cuffs. I have been using sizes 1, 3, and 5 for two years. My socks always come out perfect, no laddering. Once you learn to relax your grip and tension, knitting is so effortless with these, you barely have to move your fingers! I could never go back to using double pointed needles again, other than for starting toes, or making heel flaps and thumbs. I have recently discovered that Handsome Fibers has the best price out there for nine inch circulars. Note - I knit continental-style and a bit on the loose side. The ChiaoGoo 9" needles are a true wonder. Handsome Fibers' price is such a treat and shipping is immediate. I ordered them and two days later, I have them in my hands. I rate this company as fantastic! I love these needles! I was wanting a circular to knit some fingerless gloves and was tired of the magic loop. I didn't realize needles came in such a small size. Like another reviewer said, they do take some getting used to. It was awkward at first not having a needle touching my palm as I knit. After knitting with these for a while, I'm incredibly happy with them! These are great. Were a little fiddly at first, but I was trying to use them too big a diameter project. Works great for baby hats. So much easier to do colorwork hats on these than DPNs. These are smooth and don't catch. Highly recommend. These needles are great. I usually hate bamboo needles because I'm such a tight knitter, but the wood on these is sooo smooth. I can knit up phone cases and legwarmers with ease, no double points or finagling over long cables required. They take some getting used to, especially if you have larger hands like me, but they're so worth it. I have several pair and can't wait to by the other sizes. I'm so smitten with these, I've been ogling the 12" needles too. Goodbye double pointed needles. I used these 9" #2 needles to knit a pair of fingerless gloves. Worked out perfect. Love these needles--they are perfect for the way I knit socks. I'm back to buy a larger size to try sleeves! I have been ordering ChiaoGoo knitting needles for several years now. I absolutely LOVE them and I won't use anything else. My stitches are so much more even. They are also very well made. Thanks ChiaoGoo! Q: Regarding the 9-inch circular needles: Are the needle tips on 360 degree swivel cords? These 9 inch bamboo circulars (sizes 3 and up) have a smooth join and flexible cable that swivels! Sizes 0-2.5 have the same type of metal cable as the RED circulars, no red coating and do not swivel. Q: I am interested in the 9" size 2 in the ChiaoGoo Bamboo circular knitting needles. Can you tell me how flexible the cable is, please? 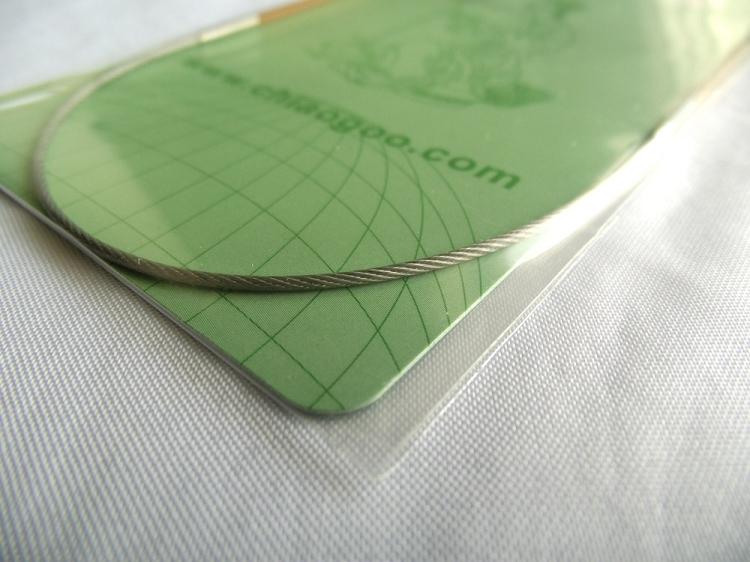 Q: How long is the needle portion of a ChiaoGoo 9" 4mm circular knitting needle? Q: What is the common size of Chiagoo fixed 9"circular needle for knitting tube socks?